Nuneaton and Bedworth Borough Council has been downplaying the risk from poor air quality for years. We have now discovered that council officers have manipulated data and consultant’s reports to mislead the public. The changes are scandalous. Air Quality Consultants Ltd produced the draft “Air Quality Assessment: Development Associated with the Local Plan, Nuneaton and Bedworth” in November 2016. We have found out that that the council requested that the end of the executive summary be significantly modified under the orders of the council director for regeneration and public protection. In council meetings and press releases, the council has been claiming that levels of NO2 are falling. They have now mothballed the automatic monitoring station. This is a systematic attempt to prevent the timely monitoring of the impact of around 4,000 extra homes being proposed north of Nuneaton. The council has secretly stopped monitoring 3 points on the Old Hinckley road including the kerbside at number 34. This point has the highest measurements on the Leicester Road gyratory, around 30% above that at the automatic monitoring station. This single monitoring tube location could be our only alarm bell for increased pollution due to current Weddington and St Nicolas developments. In the Borough Plan air quality assessment data for this point has been changed for 2013 and manipulated for 2015. The council has tried to doctor the measured values at that location and the reported values in the Borough Plan “Air Quality Assessment” are lower than in the annual air quality reports. There are many big issues not being addressed properly by the air quality assessment. 1) A large amount of the impacts of poor air quality are down to Fine Particles (PM2.5) which do not fall off in the same way as NO2. The modelled difference in PM2.5 levels with & without the plan are unbelievable. 2) NO2 has shown no signs of improving in the way the model forecasts. There has been no significant improvement over the last 10 years. 3) The NO2 has been modelled using just average link speeds over 6 hours per day. The real world has variable traffic flows over each peak 3 hour period and links do not have uniform speed when traffic tails back from junctions. 4) The council has been systematicly changing the monitoring network to capture less high readings. This manipulating of the Borough Plan evidence base is likely to have occurred in many of the other reports on which the borough plan is based including the sustainability assessments and modelling of economic growth. We need to see the other edits to the evidence base. 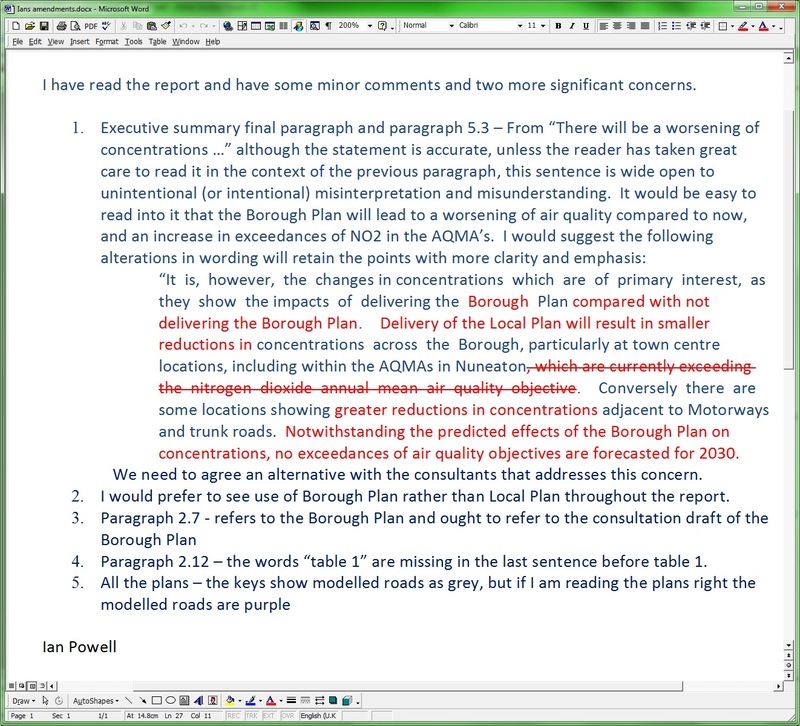 Note from NBBC director responsible for Borough Plan.